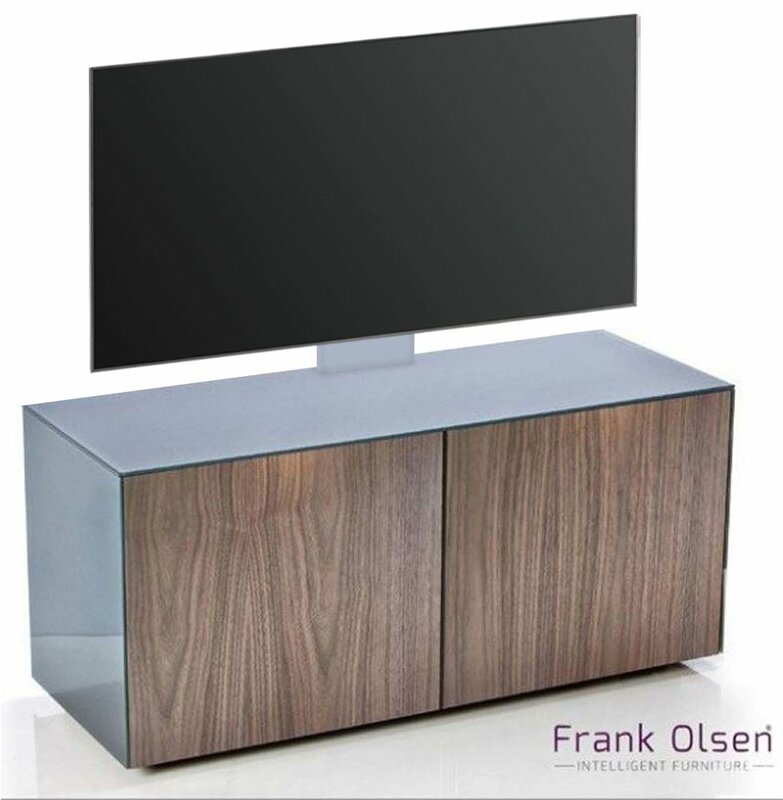 Frank Olsen INTEL1100 Grey & Walnut Cantilever TV Cabinet For TVs Up To 55"
A range of ‘Intelligent AV furniture’ designed with a passion for modern life. The Frank Olsen designs are far more than being furniture alone. They are feature rich, developed to high quality specifications, combined with stunning estetics and intelligent features which bring it to life and set it apart from any other furniture range. Every detail has been thought through down to the fantastic storage capacity for both AV equipment and general modern family life. This really is furniture that lives with the family or the AV enthusiast and goes way beyond the expectations of a TV and storage cabinet. 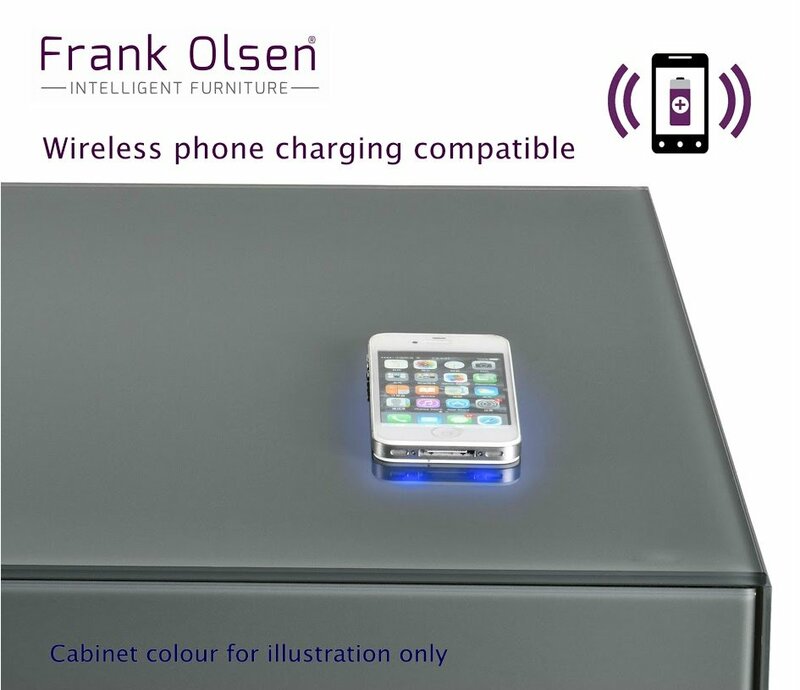 Discreet wireless phone charging compatibility (QI standard). An outstanding feature without compromising the clean lines of the design. When it is not in use, it simply is not visible. Very easy to use, very handy to have, almost magical and a true innovation in furniture ! 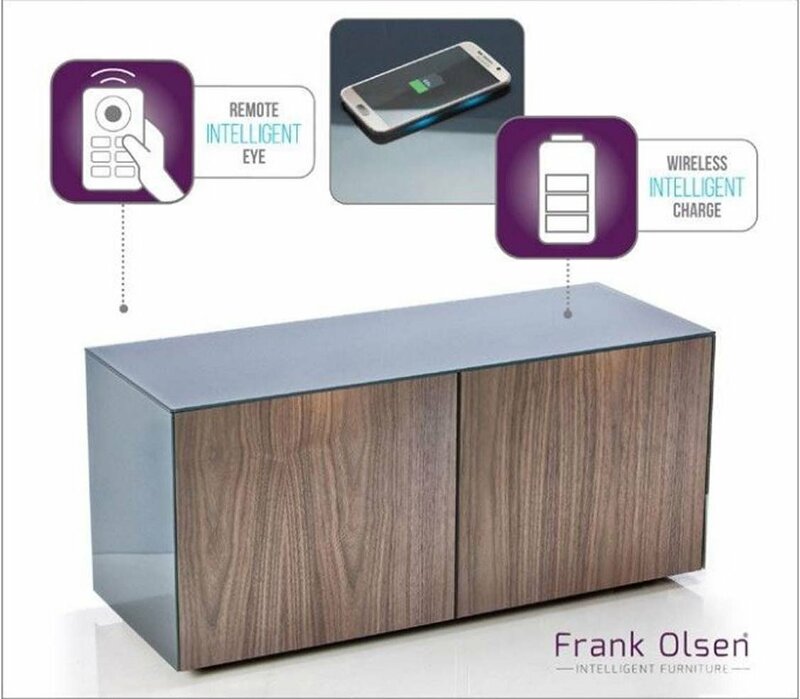 For none QI (wireless charge compatible) phones the cabinets are all supplied with both 1 x iPhone & 1 x Android microport, high quality super slim wireless charging receivers. These simply sit under your existing phone case to make almost any phone work as wireless charging with the furniture. At approx 0.5mm thick, these receivers hide perfectly under a standard phone case. The Frank Olsen Intelligent eye remote control manager. The doors of the furniture are solid construction with a high gloss glass front, there is no compromise in the design by using beam thru printed glass. The Intelligent eye system enables the use of up to 8 pieces of AV equipment to be operated as normal by the standard remote controls with the doors closed and all equipment out of sight. With this feature, the stunning design will not be ruined by seeing what is inside to watch the TV. High gloss toughened glass top, sides and doors (unless wood effect doors) for a consistent high quality clean line of design. Highly scratch resistant Frank Olsen signature internal textured grey finish. Constructed from only solid 18mm board and toughened glass throughout. Push to open doors, continuing the clean lines of the design. 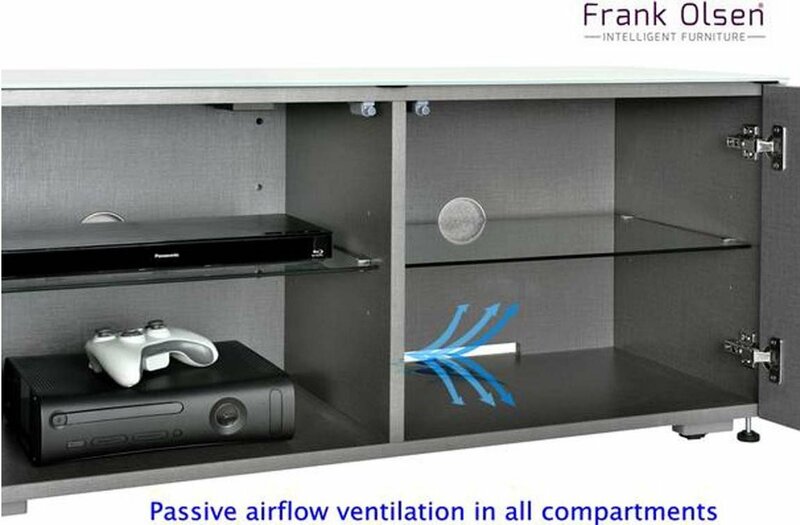 Passive built in air flow ventilation – perfect for gaming consoles. Castor wheels for easy movement and adjustable levelling feet for additional stability if required. 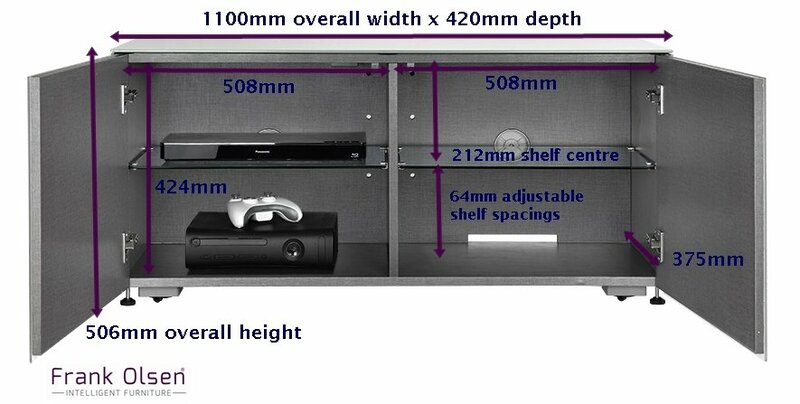 Perfect for height alignment when two units are used to form a wall of storage. Adjustable internal toughened glass shelves. Cable management system and hidden cable access points. 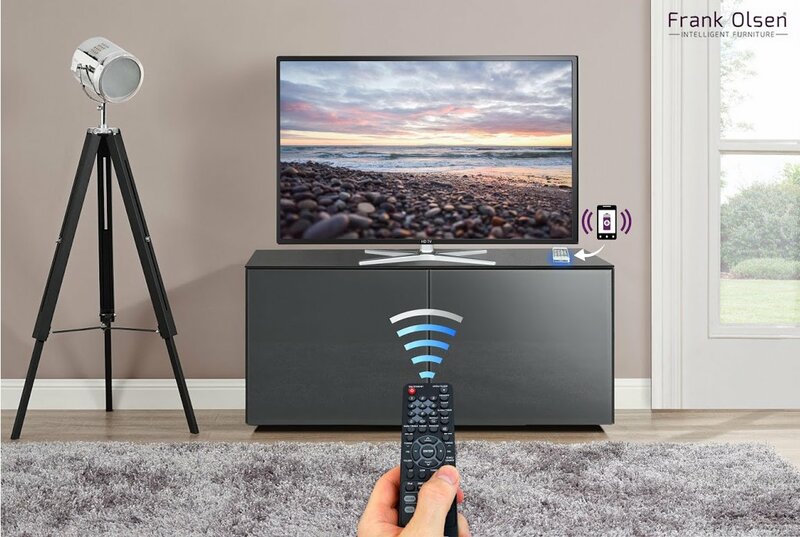 All designs are compatible with the matching Frank Olsen TV back support, perfect for use with a soundbar or if you simply prefer the tv to be mounted for better stability. This is highly recommended for a large screen when children are around because it keeps the screen stable. Frank Olsen INTEL1100WHT White TV Cabinet For TVs Up To 55"
Frank Olsen INTEL1100BLK Black TV Cabinet For TVs Up To 55"
Frank Olsen INTEL1100GY Grey TV Cabinet For TVs Up To 55"
Frank Olsen INTEL1100 Black Cantilever TV Cabinet For TVs Up To 55"
Frank Olsen INTEL1500WHT White TV Cabinet For TVs Up To 70"
Frank Olsen INTEL1100 Black & Walnut Cantilever TV Cabinet For TVs Up To 55"
Frank Olsen INTEL1100 Grey Cantilever TV Cabinet For TVs Up To 55"
Frank Olsen INTEL1100 White & Walnut Cantilever TV Cabinet For TVs Up To 55"
Frank Olsen INTEL1100 White Cantilever TV Cabinet For TVs Up To 55"